One of the first times that I had the opportunity to go pheasant hunting with a large group of people was late in the season, and I don’t think the temperature ever rose above 25 degrees that day. It was a fantastic day, there weren’t many birds flying but there was lots of walking and camaraderie. As we neared the edge of the last field, one rooster flew out of the stubble to my left. I raised my shotgun in preparation but quickly lowered it as the bird’s flight pattern crossed into what I thought might be a questionable safe zone between me and the guy to my left. That’s when the other hunter pulled the trigger and the rooster fell... and I was showered with shot. It was that day, hunting with a large group of hunters that I didn’t know, where I learned the true value and caution that only Hunter’s Education can provide. 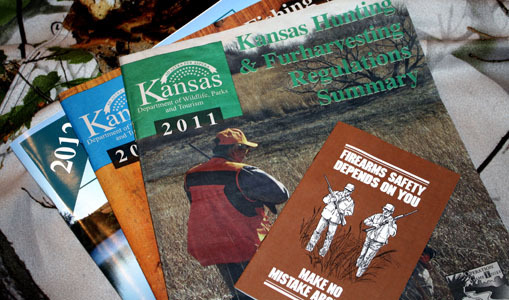 Kansas Hunter’s Education courses typically touch on a wide range of subjects, including firearms, ammunition, bowhunting, ethics, conservation and wildlife management, and even some examples of outdoor emergency situations. The even better part, is that Kansas offers its residents two different types of opportunities to complete a Hunter’s Education course, and they also offer non-residents a modified version that they like to call a “crash course.” So, basically, the State of Kansas offers everyone the opportunity to hunt in Kansas, and to do so safely. For residents, the Hunter’s Education courses are free. The traditional course (which was the only type available when I received my education) requires instruction of at least 10 hours, but typically is taught in a two day period, with the actual hours varying by course and instructor. The other option available for residents is an Internet-assisted course, created for participants whose schedules may conflict with the availability of traditional courses. It’s a three step process, but it essentially allows the participant to study and fulfill the class requirements online, then complete the course by attending a Field Day and Testing Session. If you completed a Hunter’s Education course in another state, Kansas will consider that acceptable Hunter’s Education, and you’re not required to complete an additional course. If, for some reason, a non-resident needs to complete a course, the state offers a simple “crash course.” Basically it requires online completion of an introductory course offered by the International Hunter’s Education Association and a follow-up three hour session by a Kansas “Crash Course” instructor. Elizabeth Peterson is a lifetime resident of Kansas, an avid outdoorswoman, and a new mom. She spends her free time in the great outdoors, hunting and fishing, and writing about her life and passions on her personal blog DeerPassion. You can also find her on Twitter, @DeerPassion.